SOPA, the Stop Online Privacy Act (HR3261) is a bill that is currently being considered by the US House of Representatives. SOPA and its companion Protect IP Senate bill (S.968 ) are well intended but badly drafted. If passed they have the potential to censor the Web, bankrupt web startups, stiffle innovation and severely disrupt social media and the Internet itself. Drafted and pushed by a group of large “old” media providers, SOPA and Protect IP have the laudable goal of stopping “online piracy”, primarily the sharing of copyrighted movies and music. And that’s a good thing, musicians and the movie industry have the right to be paid for their work. But SOPA and Protect IP are doing it all wrong. The majority of illegal filesharing uses BitTorrent, which because of its distributed nature is difficult to block. The bills don’t even try. Instead they make all Web sites that allow users to post content liable if a single user amonhg millions posts a copyrighted file or even a link to one. This will force sites like Facebook, Twitter, YouTube and Flickr and every blog that allows users to leave comments to review everything that’s posted. That’s probably impossible for all but the smallest sites. Search engines will be effected too. It would be illegal for Google display links to any site that hosts prohibited material. SOPA/Protect IP go much farther than the DMCA, which already lets rights holders remove infringing material sites from social media sites while providing an appeal process and protecting sites from legal action provided they remove the material. The DMCA is far from perfect, and is frequently abused for commercial gain. A study by two legal scholars found 41% of DMCA takedown notices were filed against a complainant’s competitor. There is no reason to believe that SOPA will not be abused the same way and it’s quicker, broader and provides only a five day window for appeals (there is no time limit for appealing DMCA takedown notices). What’s even scarier is the way SOPA/Protect IP will be enforced. Any rights holder can get a court order requiring all US based ISPs, domain name registrars and DNS providers to block access to any domain that the rights holder believes hosts infringing material. ISPs will need to use deep packet inspection and IP blocking to block infringing domains. These are the same techniques that Iran and China use to censor the Internet for their citizens. Once these filtering mechanisms are in place they could potentially be misused to block political dissent, whistle blowers and consumer advocacy. The bills are exteremly broad and could even be interperted to prohibt Americans from operating anonymous web proxies like those used by “Arab Spring” dissidents to get the word out on Facebook and Twitter when those sites were block by their governments. SOPA and Protect IP are technically flawed and are likely to effect the stability and availability of the Internet. 83 prominent Internet engineers and inventors including Vint Cerf and Paul Vixie have signed an open letter to Congress saying that SOPA would endager the Internet, cause security issues, stifle innovation and harm the credibility of the US on the subject of Internet censorship. 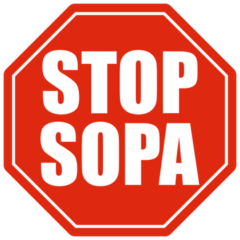 SOPA and Protect IP are opposed by most web and tech companies and organizations including: American Express, AOL, Discover, eBay, Facebook, foursquare, Google, LinkedIn, Mozilla, OpenDNS, PayPal, Twitter, Visa, Wikimedia Foundation, Yahoo!, Consumer Electronics Association, Microsoft, OpenDNS, the American Library association, the European Parliament, EFF and ACLU. Prominent publications have editorialized against it including the Stanford Law Review, Los Angeles Times, San Jose Mercury News, and The New York Times. Supporters include the RIAA, Motion Picture Association of America Viacom, US Chamber of Congress, Macmillan Publishers, News Corp., ABC, NBC, BMI, Sony, Time Warner, Comcast, Disney and the NBA. SOPA supporters have raised over $2 million to bankroll lobbying for the bill. It’s opponents have only raised half a million. Not convinced that SOPA and Protect IP are wrong? Read more about the incredible damage they would do to free speech, the open Internet and tech innovation at Wikipedia, PublicKnowledge.org, the Stanford Law Review, The New York Times, ars technica and the EFF. So, what can YOU do to fight the passege of SOPA/Protect IP? If you are a US resident you should send an email to your Congressperson and Senators. The EFF has an online form that makes it extremely easy to. A phone call or fax is even better. AmericanCensorship.org, a coallition that includes Wikimedia, Mozilla and the EFF has a web form that lets you phone your congressperson toll free. VOIP provider Altus Carrier Services has a site where you can fax your representatives in opposition to SOPA for free. Even if you don’t live in the US you can sign the petition at whitehouse.gov urging President Obama to veto SOPA if it passes. AmericanCensorship.org has a list of other things you can do to fight SOPA whether you are in the US or not, including “censoring” your website and signing a petition asking the US State Department, which is so opposed to Internet censorship outside the US to take a stand against the censorship aspects of SOPA. Act today, don’t let Hollywood and the music industry trample free speech and destroy the Internet. This entry was posted in Editorials and tagged SOPA by Dennis Bournique. Bookmark the permalink.